Michael Carrick has revealed that the only way Manchester United will be celebrating this season is if they end up winning the Premier League title. 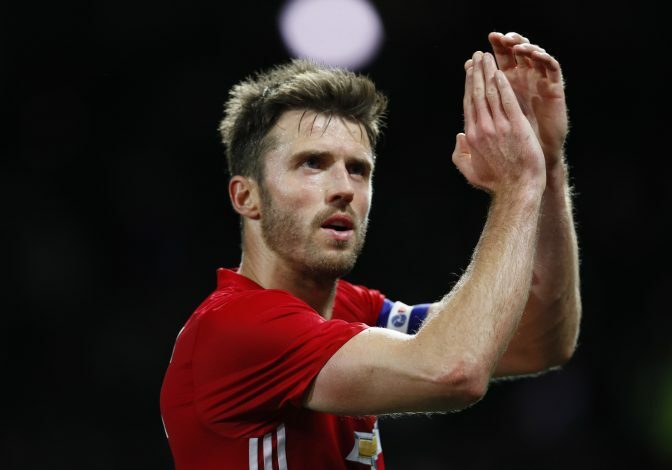 After coming extremely close to getting released by former United boss Louis van Gaal, Carrick has now reemerged under the management of Jose Mourinho and remains a pivotal member of the squad. The Englishman helps the team out with his long passes, terrific vision, calmness on the ball, and lots of experience of not only playing at the top level, but also having won almost everything there is to win at the biggest stage. The 35-year-old, who was signed by Sir Alex Ferguson from Tottenham Hotspur back in 2006, has been a part of the Red Devils’ unit that won 5 Premier League titles, a UEFA Champions League, and a FIFA Club World Cup, amongst other honours. And having won so much silverware, Carrick has now rightly revealed that he, along with his fellow teammates, will only be celebrating a first-placed finish in the Premier League. “It’s not something we’d celebrate, if we finished third, fourth or even second. “In terms of the top four, you can’t say it’s unthinkable not to make it because it’s there. United currently sit sixth in the league table – just a point behind fourth-placed Liverpool, and two behind third-placed Arsenal.